Some of these exercises are insanely difficult, some are just plain weird. If you practice them outside your neighbors will certainly think you’ve gone insane but as a dedicated Martial Artist they probably think you’re weird already. …And the power you will build will be well worth it. Learning to hit hard is a very important part of most martial arts. There are many different ways to do it and an in depth study of power can reach very high levels of skill and will take a lifetime. …but that’s not why you’re here. This program is about getting more power now, tomorrow and a month from now. Each of the exercise in this program has been carefully chosen because they will provide a significant increase in your power within 30 days of hard training. Most of them will continue to provide power gains for months and years to come if you continue to work with them. These exercises are designed to focus on key principles of human body movement and power so that you will gain benefit no matter what art you do. These seven exercises each focus on important principles of strength movement and power. Some you can start training right away, however others are extremely difficult and so we’ve also included The Basic Seven on this DVD. These seven exercises aren’t as unusual or extreme as the Advanced Seven. However each one will provide quick power gains and combined they will build very effective whole body striking power. Though some of the Basic Seven exercises are more common, most people leave out key principles that are necessary to getting the most power out of these movements. The DVD and the Ebook go into specific detail about the correct way to practice all of these exercises and get the most power out of your training. 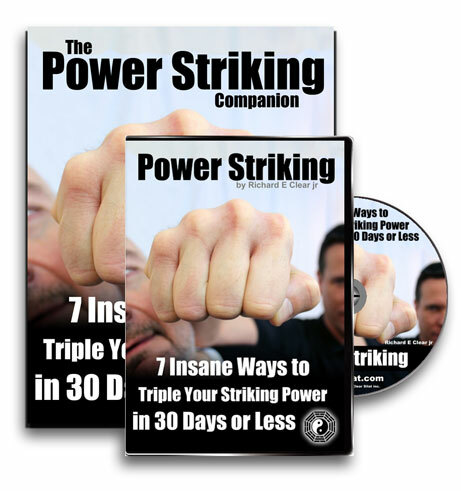 The Power Striking DVD also comes with The Power Striking Companion Ebook. This ebook will guide you through all 14 exercises and it answers some of the most commonly asked question so that you can get the most out of this program. A. Both. Some of these are mostly external with key internal components and others are mostly internal with important external work. Whichever type of art you do these exercises will build critical strengths and skills for striking with much more power than you have currently. Q. Are these exercises too difficult? Will I actually be able to do them well enough to get the benefits? A. Some of these exercises are easier than others. A few are very difficult. Included on the DVD and in The Striking Power Companion ebook are ways to build into the more difficult exercises if you are not yet able to do them. …and you will still gain power from this work as you build the strength and skill to do the complete version of each exercises. Q. What type of strikes are these exercises for? Kicks? Punches? A. These exercises focus on different striking tools and different aspects of body power. Punches, Palm Strikes, Finger Strikes, Elbows, Knees, Kicks and most other hand, arm, leg, foot or body strikes. Q. What if these are too easy? What if I already do these exercises? A. I’m sure you have seen a few of the Basic Seven before. Pay close attention to the instructions before you jump in though. There are key components to even the basic exercises that are not so common and are critical to getting the full power gains from this program. There are also exercises, especially some of the Insane Seven, that are very uncommon. ..and when used together the power gains from these exercises are magnified greatly. So, even if you are skilled with several of these already, there is a lot more power to be gained from using these exercises in combination and practicing them in the exact way we teach in this program. Q. Can I train these by myself? Do I need any equipment? A. This training can be done entirely by yourself with no equipment at all. On the DVD we do show you ways to test, check and feel the power you are building. Those tests are NOT necessary for doing the exercises. However they are useful and for them you will need either: a partner, boards you can break or a heavy bag.